Turn your little one into mini-mermaid with this handmade tail. Perfect for milestone photo sessions and kiddie costume parties, this adorable handcrafted mermaid tail transforms your small fry into her favorite mythical sea creature. Kyrgystanian artisans crochet each cheerful accessory with delicate woven details and a comfortable fit. Designed by Gulnara Kydyrmyshova; Handmade in Kyrgyzstan. Adorable and SO well made! Sent this as an out-of-town baby shower gift and I heard it was a big success at the shower and with the mom-to-be. 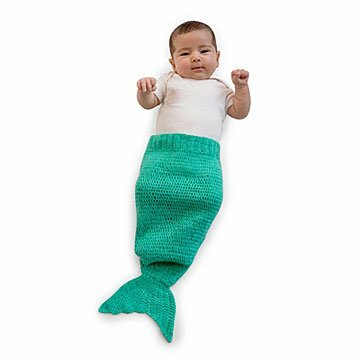 Shortly after the baby was born, they had professional pictures taken of her wearing the sweet little mermaid tail blanket. I was so proud that I had chosen to send the gift! Adorable and keeps her warm! I saw this and had to get it! It did not disappoint! Nicely made and adorable! Adorable. Best baby shower present. Will make an adorable photo for the baby book.